Seattle-based alto saxophonist and composer Jacob Zimmerman returns to the Bay Area for a concert of duos with a cast of compelling Bay Area musical characters. In an homage to the “Improvised Duos” series area keyboardist Michael Coleman has organized for several years, Zimmerman premieres eight new duo compositions, and performs them with local instrumentalists of diverse backgrounds and musical proclivities. 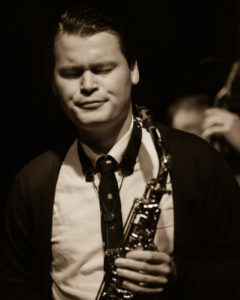 Alto saxophonist and composer Jacob Zimmerman is a versatile and integral part of Seattle’s creative music community. Jacob studied music at the New England Conservatory of Music in Boston, and Mills College in Oakland. His teachers have included Roscoe Mitchell, Jerry Bergonzi, Joe Morris and Anthony Coleman. Recently he was recognized as the “2013 Emerging Artist of Year” by Earshot Jazz in Seattle. As a composer, Jacob’s main outlets are his large chamber ensemble project Lawson, and the collective modern jazz trio Anteater. Jacob is a board member of the Seattle-based new music record label Table & Chairs. The Best Coast Jazz Composers Series at the Center for New Music showcases the extraordinary and singular talents of some of the Bay Area’s most creative and prolific jazz artists. The series feature emerging and established composers from the Bay Area, Southern California and the Pacific Northwest, in evening-length profile concerts that explore several aspects of their diverse musical personalities, and celebrates the emergence of an eclectic, innovative and wildly creative New West Coast Sound in jazz. Curated by Bay Area bassist and composer Lisa Mezzacappa.